Every PC master race folk may decide to start using an Xbox 360 controller on PC to play games. There’s nothing bad in this, experiments are a great thing. Once this idea popped up in your head, you start scouring for articles about how to setup Xbox 360 controller on PC (we know you’re not a noob, you always use Google before doing somewhat serious stuff), and the one you’re reading right now is the only article you need! So, using an Xbox 360 controller on PC is often not a problem at all, because this controller is usually compatible with PC. But there’s a very spreaded issue — some games may not recognize the gamepad, or simply don’t have controller support at all. Or what if you need to use the controller on desktop? Or for editing pictures in Lightroom? You can easily start using an Xbox 360 controller on PC for all-the-above stuff with reWASD! Connect your Xbox 360 controller to PC. Once it’s connected, you’ll see the indicator at the bottom left of reWASD window. Add a new game profile, the config will be created automatically. Time to start remapping! Note: Hook feature! Press the button you want to remap, reWASD hooks it right away. Same story with keyboard buttons, there’s no need to scroll the whole list to find Space. Just press it when the controller button that you want to remap is chosen in main interface! Now all the controller buttons are at your disposal: assign keyboard mappings to controller buttons to use an Xbox 360 controller on PC in a game that doesn’t have the native controller support. Note: See that Rumble checkbox? It does miracles. 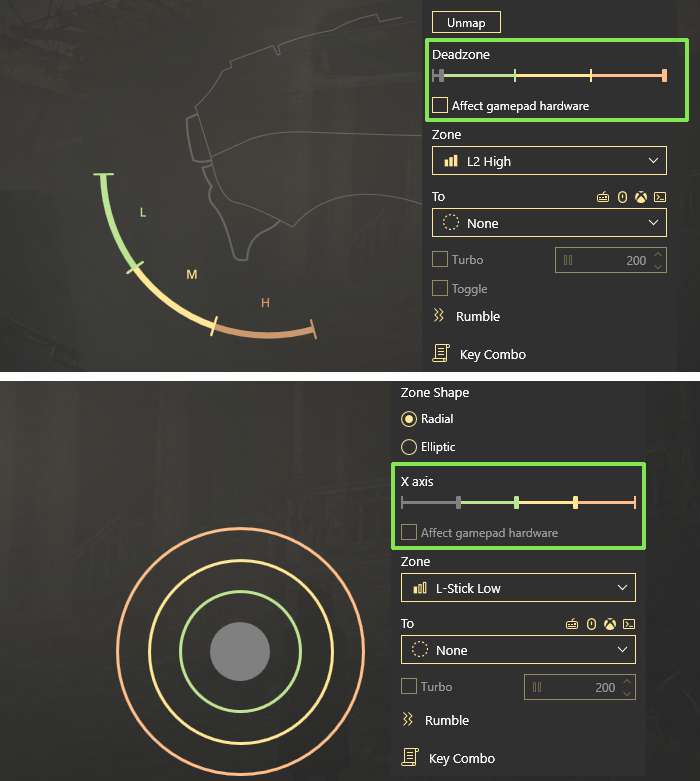 reWASD can add haptic feedback to any of digital controls (all except sticks and triggers). Once you’ve added all mappings you need, press Apply. 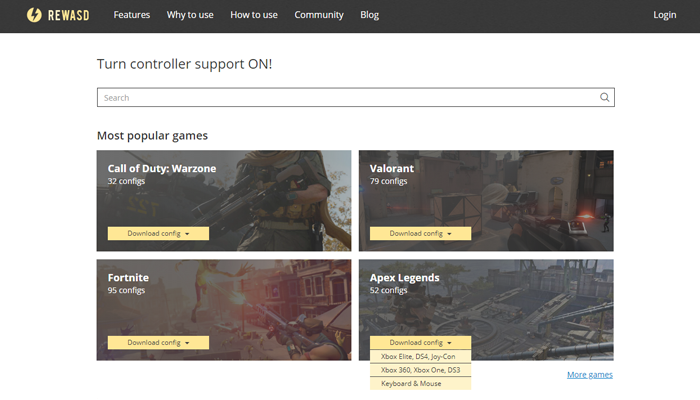 Then you can start using an Xbox 360 controller on PC with the refreshed set of bindings! Test your luck: you can check out reWASD community with lots of ready-to-go presets for many different games. It would be useful for you if you’re new to remapping world, and don’t know how to setup Xbox 360 controller on PC yet. There are so many great configs to check out! By the way, we also post the newest presets on our Facebook page, so don’t forget to follow us. You can also contact us via Facebook messages and ask questions, we’ll give you the answer right away! On top of that, you also can calibrate Xbox 360 controller hardware settings, like stick response or deadzone for analog controls. Let’s review what exactly you can customize with reWASD! There are a lot of other features that ease the way how to use Xbox 360 controller on PC. The one we consider the most important is Unmap: if the game has the gamepad maintenance, you can overlap it with reWASD bindings if you turn off native controller support. That’s the best feature to use if you don’t know what to do with the uncomfortable layout and want to apply your custom one. Find out more about how to mute controller buttons in out blog post. Rickety sticks? Calibrate Xbox 360 controller deadzones! If your controller is an old buddy and the analog controls (sticks and triggers) are rickety, you can adjust deadzone on Xbox 360 controller for PC usage. This setting is available for both sticks and triggers. In that case, you can make the deadzone bigger to avoid the unwanted actions. Moreover, if your controller is out-of-the-box and you’re savagely pushing them to get the minimum response — reWASD will save your day as well. Just make the deadzone smaller, your analog controls will become more sensitive. You also can change the range where only W, A, S and D reproduce. To make your stick super accurate, you need to set the vertical and horizontal axis ranges to maximum. Thus, the transitional movements won’t happen. That’s one of the ways to calibrate Xbox 360 controller and make your in-game actions more legible. 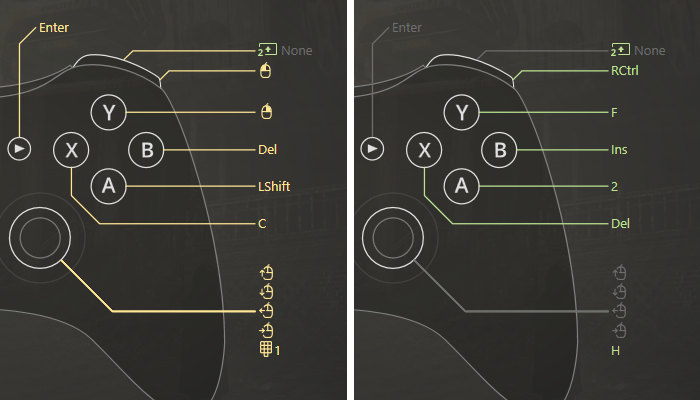 Another feature that makes using an Xbox 360 controller on PC easier and relates to analog controls are Zones. You can add 3 additional mappings that will reproduce together with the main mappings when the stick or trigger moves to a certain area. Make your in-game actions unintentional: remember pressing Shift and Alt together with WASD so your character run or walk? reWASD makes it possible! 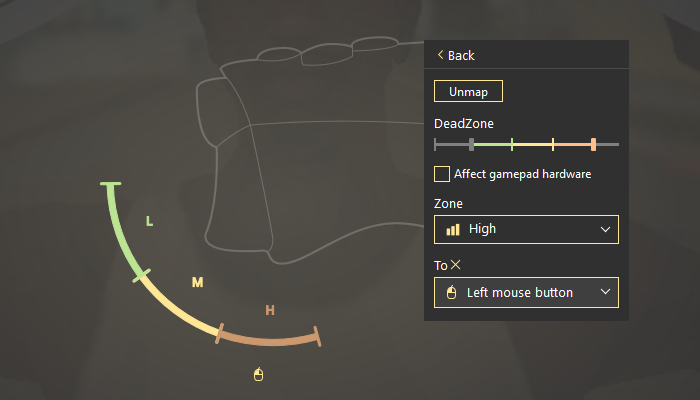 Map WASD as main mappings, Alt (control for walking slowly) to Low zone, and Shift (control for running) to High zone. As a result, when you lightly press the stick you’ll walk slowly, the Medium zone is empty, so you walk regularly. And if you press Stick to the edge point you run. Isn’t that the best way of how to setup Xbox 360 controller on PC? ;) Come check out the blog post about the zones feature for more information and for a detailed guide! Some games have lots of controls to use, and in most cases the regular 24 controller buttons are not enough. That’s where reWASD comes in hand once again: we propose two ways of how to use Xbox 360 controller on PC and increase the number of mappings: it’s Shift mode and Slots feature. Shift mode: basically, you set one controller button as Shift modifier before using an Xbox 360 controller on PC, and when you press and hold it — other controller buttons change to another set. Slots feature: appeared in one of our latest releases. It permits to apply up to 4 different configs to one controller simultaneously. To switch between the configs you need to use the hardware combination — press two bumpers and one of XYAB buttons. Isn’t that a comfy way to multiply bindings for Xbox 360 controller on PC? Learn more about reWASD Combos on our Facebook page. So here it is, now you know the best way of how to use Xbox 360 controller on PC! If you still have some questions — don’t hesitate to contact us in the comments below or via Facebook messages. And don't forget to follow our Pinterest page for more news!